Neoliberalism’s hatred of democracy, the common good and the social contract has unleashed generic elements of a fascist past in which white supremacy, ultra-nationalism, rabid misogyny and immigrant fervor come together in a toxic mix of militarism, state violence and the politics of disposability. Modes of fascist expression adapt variously to different political historical contexts assuring racial apartheid-like forms in the postbellum U.S. and overt encampments and extermination in Nazi Germany. Fascism – with its unquestioning belief in obedience to a powerful strongman, violence as a form of political purification, hatred as an act of patriotism, racial and ethnic cleansing, and the superiority of a select ethnic or national group – has resurfaced in the United States. In this mix of economic barbarism, political nihilism, racial purity, economic orthodoxy and ethical somnambulance, a distinctive economic-political formation has been produced that I term neoliberal fascism. As the ideas, values and institutions crucial to a democracy have withered under a savage neoliberalism that has been 50 years in the making, fascistic notions of racial superiority, social cleansing, apocalyptic populism, hyper-militarism and ultra-nationalism have gained in intensity, moving from the repressed recesses of U.S. history to the centers of state and corporate power.6 Decades of mass inequality, wage slavery, the collapse of the manufacturing sector, tax giveaways to the financial elite and savage austerity policies that drive a frontal attack on the welfare state have further strengthened fascistic discourses. 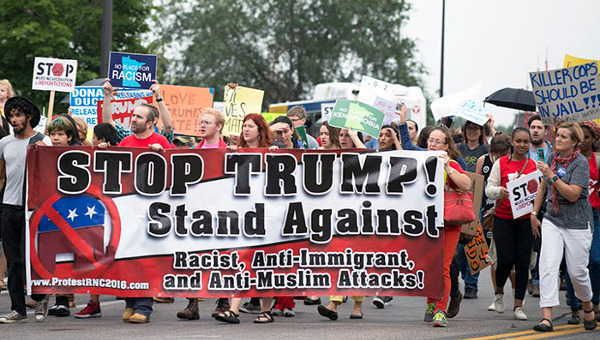 They also have redirected populist anger against vulnerable populations and undocumented immigrants, Muslims, the racially oppressed, women, LBGTQ people, public servants, critical intellectuals and workers. Not only has neoliberalism undermined the basic elements of democracy by escalating the mutually reinforcing dynamics of economic inequality and political inequality – accentuating the downhill spiral of social and economic mobility – it has also created conditions that make fascist ideas and principles more attractive. Furthermore, the merging of neoliberalism and fascism has accelerated as civic culture is eroded, notions of shared citizenship and responsibility disappear, and reason and informed judgment are replaced by the forces of civic illiteracy. State-sanctioned attacks on the truth, facts and scientific reason in Trump’s America are camouflaged as one would expect when led by the first reality TV president – by a corporate-controlled culture of vulgarity that merges celebrity culture with a nonstop spectacle of violence. Neoliberalism strips democracy of any substance by promoting an irrational belief in the ability of the market to solve all social problems and shape all aspects of society. This shift from a market economy to a market-driven society has been accompanied by a savage attack on equality, the social contract and social provisions as wages have been gutted, pensions destroyed, health care put out of reach for millions, job security undermined, and access to crucial public goods such as public and higher education considerably weakened for the lower and middle classes. While it is true the U.S. may not be putting millions in gas chambers or promoting genocide, there remain reworked elements of the past in the present. For instance, there are already echoes of the past in existing and expanding infrastructures of punishment – amounting to a carceral state – that have grown exponentially in the past four decades. In fact, the United States has the largest prison system in the world, with more than 2.5 million people incarcerated. Astonishingly, this figure does not include immigrant detention centers and other forms of encampment around the U.S. border with Mexico. The visibility of this state-sanctioned punishing apparatus and its similarity to a fascist history was on display recently with the caging of young immigrant children who were forcibly separated from their parents at the southern border for months at a time. Needless to say, such institutions and actions resonate with deeply disturbing events of a dark past for which the violent separation of families was a hallmark feature of fascist brutality. Fascism in the United States has arrived slowly by subversion from within. Its roots have been on display for decades and emerged most visibly with President George W. Bush’s and then President Barack Obama’s war on terror. Bush, in particular, embraced unapologetically a raw display of power that sanctioned torture, domestic spying, secret prisons, kill lists, laws sanctioning indefinite detention, warrantless searches and war crimes. Obama did little to correct these legal illegalities and Trump has only breathed new life into them. Instead of the sudden appearance on American streets of thugs, brown shirts, purges and massive state violence – the state violence waged against African Americans notwithstanding – fascism has been resurrected through the enabling force of casino capitalism, which has unleashed and mobilized a range of economic, political, religious and educational fundamentalisms. The corporate state, fueled by a market fundamentalism and a long legacy of racial apartheid, has imposed almost incomprehensible cruelty on poor and vulnerable black populations. The merging of neoliberalism and fascist elements of white supremacy and systemic racism is particularly evident in the environmental racism, dilapidated schools and air pollution that have come to light recently.28 The short list includes going so far as to sacrifice poor black children in Flint, Mich., to the perils of lead poisoning to increase profits, subject the population of Puerto Rico to unnecessary despair by refusing to provide adequate government services after Hurricane Maria,29 and creating conditions in which “America’s youngest children, some 47 per cent” under the age of 5, “live in low-income or poor households.”30 W.E.B. Du Bois’ notion of a “racial dictatorship” in his classic Black Reconstruction in America has been resurrected under Trump. As U.N. Special Rapporteur Philip Alston reported, amid a massive concentration of wealth among the upper 1 per cent in the United States, 40 million people live in poverty and 18.5 million Americans live in extreme poverty. According to Alston, such neoliberal policies are “aggressively regressive” in their promoting of harsh work requirements for welfare recipients, cutting back programs to feed poor children, and the willingness to both incarcerate young children and separate them from their parents.31 All the while, the Trump administration has shifted massive resources to the wealthy as a result of a tax policy that shreds $1.5-trillion from the federal budget. For Wolin, neoliberalism was the endpoint of a long process “to transform everything – every object, every living thing, every fact on the planet – in its image.”35 He believed that this new political formation and form of sovereignty in which economics dominated politics was hostile to both social spending and the welfare state. Wolin rightly argued that under neoliberalism, political sovereignty is largely replaced by economic sovereignty as corporate power takes over the reins of governance. Trump has elevated himself as the patron saint of a ruthless neoliberalism. This is evident in the various miracles he has performed for the rich and powerful. He has systemically deregulated regulations that extend from environmental protections to worker safety rules. He has enacted a $1.5-trillion tax policy that amounts to a huge gift to the financial elite and all the while maintaining his “man of the people” posture. He has appointed a range of neoliberal fundamentalists to head major government posts designed to serve the public. Most, like Scott Pruitt, the former head of the Environmental Protection Agency, and Betsy DeVos, the secretary of Education, have proved to be either corrupt, incompetent, or often both. Along with the Republican Congress, Trump has vastly increased the military budget to $717-billion, creating huge financial profits for the military-industrial-defense complex while instituting policies that eviscerate the welfare state and further expand a war machine that generates mass suffering and death. Trump has reduced food assistance for those who are forced to choose between eating and taking medicine, and his policies have prevented millions from getting adequate health care.43 Last but not least, he has become a cheerleader for the gun and security industries going so far as to call for the arming of teachers as a way to redress mass shootings in the nation’s schools. All of these policies serve to unleash the anti-liberal and anti-democratic passions, fears, anxieties and anger necessary to mainstream fascism. Trump extends the logic of redundancy and disposability beyond economic categories to all those others who cannot fit into a white nationalist script. This is the language of the police state – one fashioned by the history of U.S. apartheid. The endpoint of the language of white supremacy via a regressive crime policy is a form of social death, or even worse. What is frightening about Trump’s racist vocabulary is that it registers a move from the coded language of benign neglect to policies marked by malignant cruelty that legitimates state violence. Fascism begins not with violence, police assaults or mass killings, but with language. Trump reminded us of this in 2015 while announcing his candidacy for president. He stated, without irony or shame, that “when Mexico sends its people, they’re not sending the best. They’re sending people that have lots of problems and they’re bringing those problems. They’re bringing drugs, they’re bringing crime. They’re rapists and some, I assume, are good people…”48 This is more than the language of polarization or a strategic dog whistle, it is an overt discourse and theatrical performance in the service of white supremacy and racist violence, a logic largely missed by the mainstream press at the time. This initial blast of racist invective served to forecast how Trump’s campaign and presidency would appeal to white nationalists, the alt-right and other neo-Nazi groups. It is worth noting that words are not just about the production of meaning but also about how they generate consequences, especially in light of how such meanings – buttressed by state-sanctioned relations of power – function in a larger context. Some meanings have a force that others don’t, especially because power confers authority and can set in motion a range of effects. This is particularly clear in light of how Trump uses the power of the presidency at times when reacting to critics, especially those who garner some public attention through their criticism of him or his policies. His attempts to squelch dissent takes on a rather ruthless register as he often publicly humiliates those who criticize him, threatens their livelihood and uses language that functions to incite violence against his critics. We have seen too many instances in which Trump’s followers have beaten critics, attacked journalists and shouted down any form of critique aimed at Trump’s policies – to say nothing of the army of trolls unleashed on intellectuals and journalists critical of the administration. Reminiscent of Nazi tactics to dehumanize enemies, he has called some undocumented immigrants “animals” and “criminals,” and has used the word “infest” in referring to immigrants on the southern border. Columnist and author Aviya Kushner asserted Trump’s tweet claiming that immigrants will “infest our country” bears an alarming resemblance to the Nazi claim that Jews were carriers of disease.53 In response to Trump’s use of the term “animal” to refer to some immigrants, Juan Cole argues the Nazis used the term as a “technical term, ‘Untermensch’ or underman, subhuman” in referring to “Jews, gypsies, gays, and other groups as well as the slaughter of Russian boys at the Eastern Front.”54 Making them appear as less than human paved the way “toward permitting their elimination.”55A convergence between Trump’s language and the race-based ideology of Holocaust-era Nazis was clearly heard when Trump implied a moral equivalency between the violence perpetrated by white supremacists and neo-Nazis marching in Charlottesville and the presence of peaceful protesters demonstrating for the removal of a Confederate statue. 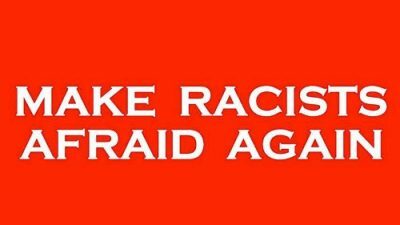 Trump’s scapegoating rhetoric of demonization and bigotry not only dehumanizes racialized others, it also prepares the ground for encouraging hate groups and an intensification of hate crimes. Even with the insight of history, comparisons between the older orders of fascism and Trump’s regime of brutality, aggression and cruelty are considered by commentators to be too extreme. There is a cost to such caution. As writer Jonathan Freedland points out in The Guardian, “If the Nazi era is placed off limits, seen as so far outside the realm of regular human experience that it might as well have happened on a distant planet – Planet Auschwitz – then we risk failure to learn its lessons.”61 Knowing how others successfully fought against elected demagogues such as Trump is crucial to a political strategy that reverses impending global catastrophe. Henry A. Giroux currently is the McMaster University Professor for Scholarship in the Public Interest and The Paulo Freire Distinguished Scholar in Critical Pedagogy. His most recent books include The Violence of Organized Forgetting (City Lights, 2014), Dangerous Thinking in the Age of the New Authoritarianism (Routledge, 2015), coauthored with Brad Evans, Disposable Futures: The Seduction of Violence in the Age of Spectacle (City Lights, 2015), and America at War with Itself (City Lights, 2016). His website is www.henryagiroux.com. Jeffrey C. Isaac, “Is there illiberal democracy?” Eurozine , Aug. 9, 2017. For an analysis of the complex legacy of right-wing and fascist forces that have contributed to Trump’s election and his popularity among fringe groups, see Shane Burley, Fascism Today: What It Is and How to End It (Chicago: AK Press, 2017). Neoliberalism has a long and complex history and takes a variety of forms. I am using the more generic elements of neoliberalism as I use the term in this essay. See Kean Birch, “What Exactly is Neoliberalism?” The Conversation , Nov. 2, 2017. For an extensive analysis of neoliberalism in terms of its history and variations, see Pierre Dardot and Christian Laval, Never Ending Nightmare: How Neoliberalism Dismantles Democracy (New York: Verso, 2019); Richard D. Wolff, Capitalism’s Crisis Deepens: Essays on the Global Economic Meltdown (Chicago: Haymarket, 2016); Wendy Brown, Undoing the Demos: Neoliberalism’s Stealth Revolution (New York: Zone Books, 2015), Henry A. Giroux, Against the Terror of Neoliberalism (New York: Routledge, 2008), and David Harvey, A Brief History of Neoliberalism (Oxford University Press, 2005). John Bellamy Foster, “Neofascism in the White House,” Monthly Review , April 1, 2017. Wendy Brown, Undoing the Demos: Neoliberalism’s Stealth Revolution (New York: Zone Books, 2015), p. 9. One brilliant source here is Henrich Geiselberger, The Great Regression (Cambridge: Polity Press, 2017). Caleb Crain, “Is Capitalism a Threat to Democracy?” The New Yorker , May 14, 2018. Anis Shivani, “This is our neoliberal nightmare: Hillary Clinton, Donald Trump, and why the market and the wealthy win every time,” Salon , June 6, 2016. Fintan O’Toole, “Trial Runs for Fascism Are in Full Flow,” Irish Times , June 26, 2018. See, especially, Michael D. Yates, The Great Inequality , New York: Routledge, 2016 and Joseph E. Stiglitz, The Price of Inequality , New York: Norton, 2012. Wendy Brown, “Apocalyptic Populism,” Eurozine , Sept 5, 2017. Timothy Snyder, “The Study of the Impossible, not the Inevitable,” Eurozine , July 24, 2018. Henry A. Giroux, “Challenging Trump’s Language of Fascism,” Truthout , Jan. 9, 2018. Timothy Snyder, On Tyranny: Twenty Lessons From the Twentieth Century , London: Polity Press, 2017: New York, NY, p. 65. Paul Gilroy, Against Race , Cambridge: Harvard University Press, 2000, p. 141. Erin Aubry Kaplan, “Presidents used to speak for all Americans. Trump speaks for his racist, resentful white base,” Los Angeles Times , Nov. 5, 2017. Theodor W. Adorno, “The Meaning of Working Through the Past,” Guild and Defense , trans. Henry W. Pickford (Cambridge: Harvard University Press, 2010), pp. 214. Hannah Arendt, The Origins of Totalitarianism (New York: Harcourt, Brace, Jovanovich: 1973). Roger Berkowitz, “Why Arendt Matters: Revisiting ‘The Origins of Totalitarianism,’” Los Angeles Review of Books , March 18, 2017. Cited in Marie Luise Knott, Unlearning With Hannah Arendt , trans. by David Dollenmayer (Other Press: New York, 2011, 2013), p. 17. Robert O. Paxton, “The Five Stages of Fascism,” The Journal of Modern History , Vol. 70, No. 1, March 1998. See, for instance, Stephanie McCrummen, “Judgment Days: God, Trump, and the Meaning of Morality,” The Washington Post , July 21, 2018. See, for instance, Parul Sehgal, “Toxic History, Poisoned Water: The Story of Flint,” New York Times , July 3, 2018. Heather Koball and Yang Jiang, Basic Facts About Low-Income Children Under 9 Years, 2016 , (New York: National Center for Children in Poverty, January 2018). Amy Goodman, “Blistering U.N. Report: Trump Administration’s Policies Designed to Worsen Poverty & Inequality,” Democracy Now! , June 15, 2018. David Harvey, “Organizing for the Anti-Capitalist Transition,” Monthly Review , Dec. 15, 2009. Jeremy B White, “Los Angeles sues drug companies for ‘driving opioid epidemic’; Lawsuit accuses companies of ‘borrowing from the tobacco industry’s playbook’,” The Independent , May 3, 2018. Leon Wieseltier, “How voters’ personal suffering overtook reason – and brought us Donald Trump,” Washington Post , June 22, 2016. Candace Norwood, “I want ‘my people’ to ‘sit up at attention’ like in North Korea,” Politico , June 15, 2018. See, for instance, Paul Street, “Capitalism: The Nightmare,” Truthdig , Sept. 20, 2017. Ta-Nehisi Coates, “The First White President,” The Atlantic , October 2017. John Feffer, “Donald Trump’s Flight 93 Doctrine,” The Nation , July 23, 2017. Nick Miroff, Amy Goldstein and Maria Sacchetti, “‘Deleted’ families: What went wrong with Trump’s family-separation effort,” The Washington Post , July 28, 2018. Amber Phillips, “‘They’re rapists.’ President Trump’s campaign launch speech two years later,” The Washington Post , June 16, 2017. Lena H. Sun and Juliet Eilperin, “CDC gets list of forbidden words: Fetus, transgender, diversity,” The Washington Post , Dec. 15, 2017. Hilary Brueck, “The Trump Administration has been quietly removing content from federal websites — here’s the before and after,” Business Insider , Jan. 11, 2018. Ruth Ben-Ghiat, “Beware of President Trump’s Nefarious Language Games,” The Washington Post , Dec. 21, 2017. 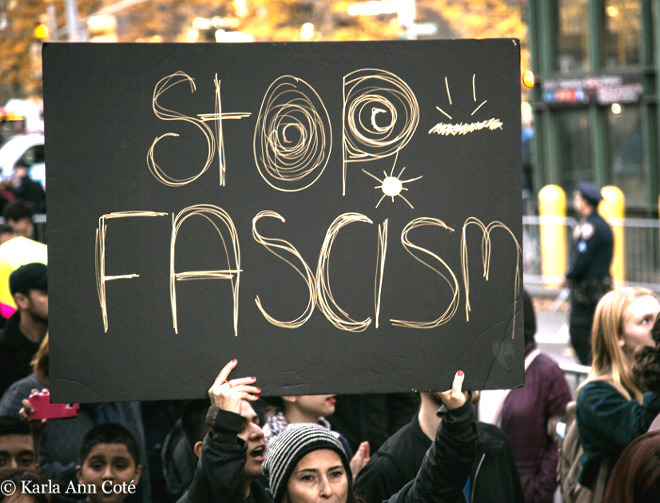 Rose Sydney Parfitt (Cihan Aksan and Jon Bailes, eds), “One Question, Fascism (Part One): Is Fascism making a comeback?” State of Nature Blog , Dec. 3, 2017. Aviya Kushner, “‘INFEST’ – The Ugly Nazi History of Trump’s Chosen Verb About Immigrants,” Forward , June 20, 2016. Juan Cole, “What Have We Become? What We Have Always Been,” Common Dreams , May 17, 2018. Clark Mindock, “Number of hate crimes surges in year of Trump’s election,” The Independent , Nov. 14, 2017. Danielle Douglas-Gabriel and Tracy Jan, “DeVos called HBCUs ‘pioneers’ of ‘school choice.’ It didn’t go over well,” The Washington Post , Feb. 28, 2017. Ariel Dorfman, “How to Read Donald Trump: On Burning Books but Not Ideas,” TomDispatch , Sept. 14, 2017. Michael S. Schmidt and Maggie Haberman, “Mueller Examining Trump’s Tweets in Wide-Ranging Obstruction Inquiry,” The Washington Post , July 26, 2018. Jonathan Freedland, “Inspired by Trump, the World Could Be Heading Back to the 1930s,” The Guardian , June 22, 2018. Hannah Arendt, “The Image of Hell,” Commentary , Sept. 1, 1946. Cass R. Sunstein, “It Can Happen Here,” The New York Review of Books , June 28, 2018. Byung-Chul Han, In the Swarm: Digital Prospects , tr. Erik Butler (Cambridge, Mass. : MIT Press, 2017), p. 13. Carl Cassegard, “Individualized Solidarity,” Eurozine , July 18, 2018. Richard J. Bernstein, “The Illuminations of Hannah Arendt,” The New York Times , June 20, 2016.